Fill Valves are an essential part of your toilet. Korky fill valves help fix slow refilling, noisy or constantly running toilet. Compatible with most toilet brands, including American Standard, Kohler, TOTO and others. The R528 from Korky is a Replacement Cap for 528 series Fill Valves. Features:Fits.. Features:Universal compatibility Adjustable, fits most 2-piece and 1-piece toilets Incl.. The 528MP from Korky is a QuietFill Platinum Universal Toilet Fill Valve (1.6 GPF or less). This dur.. The 818BP from Korky is a QuietFill Universal Toilet Fill Valve & 2” Flapper Set. This durable f.. The 528PRO from Korky is a PRO Grade Universal Toilet Fill Valve (extended warranty). It offers a su.. The 528T from Korky is a TOTO Fill Valve for G-Max and Power Gravity Toilets. Features: .. The 528GT from Korky is a Genuine TOTO Fill Valve for Drake, Eco Drake, Ultramax and others.Fe.. 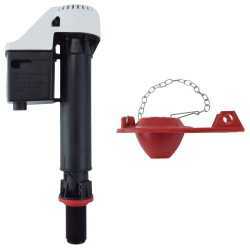 The 818MP from Korky is a QuietFill Platinum Universal Toilet Fill Valve & 2” Flapper Set (1.6 G..